Our web browsing test is slightly different from what we ran in the iPhone review. We used a total of 7 web pages, but of much larger sizes than our first test. The first page was simply a counter page, the second was our review of the Core 2 Duo E6750, followed by our article on AMD's Phenom introduction, an excerpt from our Quad FX article, our entire iPhone review, an article on Intel's Turbo Memory and our entire AMD Radeon 2900 XT review. Each page was loaded by the browser and was set to forward to the next page (in the above order) after 10 seconds; the screens on the phones were set to remain on constantly, with the Blackjack set to brightness level 3, and the iPhone set to approximately 30%. All backlight timers were disabled. Bluetooth was enabled but not paired to any devices. 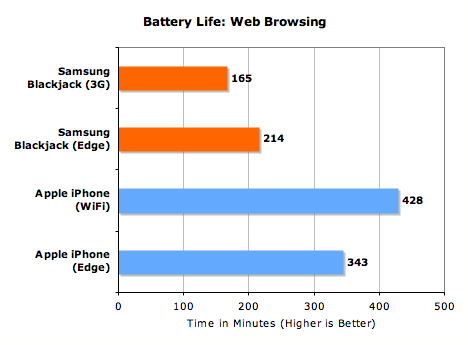 Web pages loaded a lot faster, but the Blackjack's battery was drained at a faster rate as well. With 3G enabled, the Blackjack lasted 2.75 hours and with it disabled, over 3.5 hours. Neither time is particularly great, but the impact of enabling 3G was significant: battery life was reduced by almost 23%. The situation with Wi-Fi vs. EDGE was completely different, while on Wi-Fi the iPhone lasted longer than on EDGE. The improvement in battery life was just under 25%, giving us an extra 85 minutes of usage on the iPhone. Note that all of these tests were with excellent signal strength, and battery life is negatively impacted by hopping between cell towers or working with weak signals; regardless, the results here should apply regardless of the situation. At least based on these initial results, it would seem that Apple's Wi-Fi implementation is a no-brainer: you get better performance and better battery life. It definitely doesn't have the convenience of 3G, but if you find yourself using your phone in areas where Wi-Fi is prevalent then it makes a lot of sense. Yep same here, i'm in Australia and would have bought an iPhone if it supported 3G. Such a shame. I ended up with a Samsung Blackjack and it's fantastic sofar. Stop defending the iPhone's lack of 3G. (You seem to keep justifying their lack of the 3G feature saying how they made a 'wise' choice). In other parts of the world, and its a very well known fact that 3G drains the battery tremendously. Yet every single phone has 3G and we work within their operating limits. From a technology/market demand/innovation perspective, adoption of new technologies will push the envelope that will benefit the end users (you and me). This pushes the manufacturer to keep innovating, unlike Apple, who decided to take one step back and provide less features and charge you a bomb for it, and you keep praising them. Since 2G is less chips, less pcb assembly mounting and traces, and the chips themselves are simpler and more mature, THE OLD CHIPS MAKE IT CHEAPER TO MANUFACTURE THAN 3G. Simple as that. Reduced costs of production and parts make for bigger profits. I have an AT&T 8525 and disable 3G on it. When using MS Push I get less than 10hrs on it with 3G, I'm in NYC with full signal all day. On GSM it lasts all day till I get to charge it at night. So even thought I have the 3G capability, it is unusable due to ridiculous power consumption. Are you saying you can use edge to make voice conversations instead of GSM? I have never heard of that. So what about GPRS. The whole point of why you get less talk time over UMTS is because it is WCDMA and is inherit in the technology. Wikipedia it and see for yourself. It is not clear to me from your webpage results that the faster connection wasn't largely impacted by the fact that it simply rendered more pages. That is what is the cost of rendering the page, not just getting the data. It would be helpful to know how long the battery lasted on both phones with the screen on but doing nothing. And what the hell did you guys talk about for 9 hours, anyway? Excellent article. The first time i saw an iPhone i knew Apple wouldn't allow a user-replaceable battery. Why? It would ruin the iPhone's aesthetics. If you've ever bought a Mac before you'd understand. I expect Apple to incorporate a really slick mechanism to open the chassis without uglifying the iPhone sometime soon. Also, when i heard that 3G would not be supported, i immediately thought about [chip]space. Maybe EL Stevo mandated that the iPhone not exceed "X" mm thickness. Hey, it happened with the Powerbook G4.